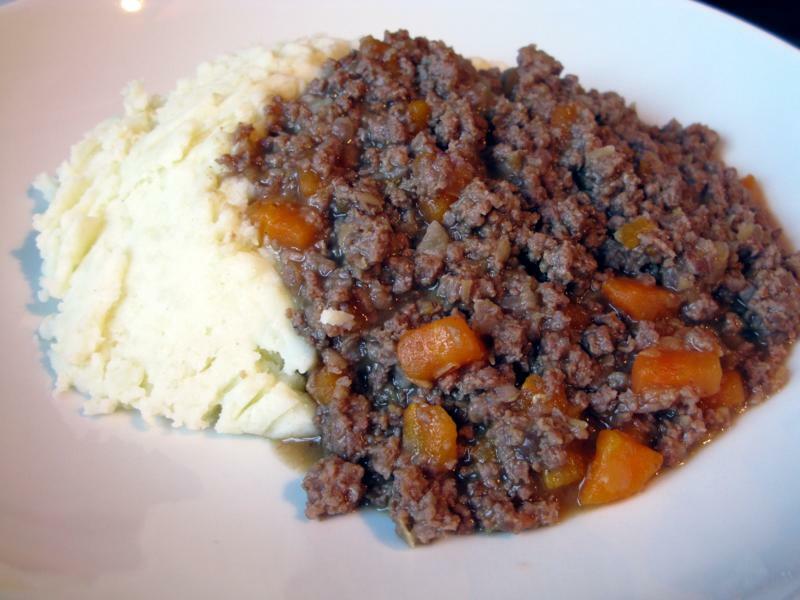 Mince and tatties is a popular Scottish dish, consisting of minced beef and mashed potato. Traditionally, the meat came from cheaper cuts of beef, such as Chuck and Blade or Neck and Clod, as opposed to the finer cuts used for steaks or roasting joints. However in modern times steak mince is often used. There is no set recipe or form of cooking and large variations can occur from cook to cook. Essentially the dish consists of varying amounts of onions, minced beef, carrots or other root vegetables, seasoning and stock (beef, chicken or lamb), to which some cooks add thickening agents such as cornflour. Mince and Tatties is often served with mealie - a mixture of oatmeal, onion and suet.